Costa Rica East & Guatemala in Nov 2013. Excursions for 2014 will be added soon. Immediately after I returned from more than a month in the Neotropics for my annual mid-winter Operation RubyThroat hummingbird expeditions, feeder birds at Hilton Pond Center were so numerous I just HAD to take time to band them. I also started the slow but tedious process of sifting through photographs and correlating banding data from those weeks in Nicaragua and Belize--all while trying to put together my on-line summary report for each trip. (I'm beginning to think the write-ups take longer than the excursions themselves!) To further slow me down I had lots of other family and work-related obligations to catch up on after being gone for 32 days. In any case, "This Week at Hilton Pond" went on hold for a while and finally resumed as I finished the photo essays for Nicaragua . . . then Belize Week 1 . . . and, finally, Belize Week 2. Those reports are now on-line as my three most recent installments of "This Week." As a result of all this I haven't previously posted any "This Week at Hilton Pond" installments for late March, April, or May, but that didn't mean I wasn't doing any banding or making natural history observations. 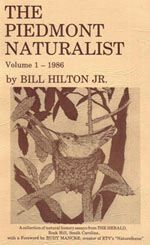 Rather than publishing my usual on-line photo essays I made regular postings to the Hilton Pond Center Facebook page, so folks at least had an on-going account of nature happenings here in the Carolina Piedmont. Since not everyone "Likes" the Center's Facebook page--and to provide some continuity while providing a permanent record of this year's phenology--the next several installments of "This Week at Hilton Pond" will be back-dated compilations of the Center's Facebook postings, placed previously on the Web. The first compilation (below) is for the latter half of March, and more will follow shortly thereafter as I split both April and May into two segments each before returning to my "normal" format. (In other words, for a while "This Week at Hilton Pond" will look more like a general blog than a photo essay devoted to a single topic.) However, even if you've already seen some of the info on Facebook I hope you'll look again; it won't be too dated because I've added text and photos to most of the entries. 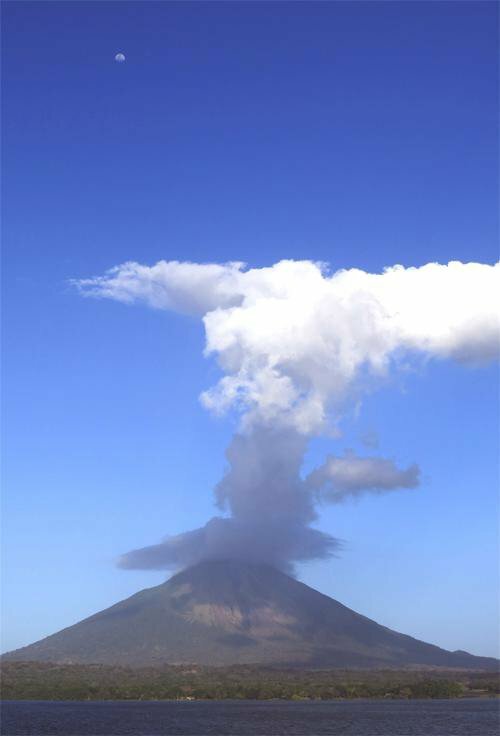 After my first-ever Operation RubyThroat hummingbird expedition to Nicaragua (see photo above of Ometepe Volcano on Lake Nicaragua) followed by two expeditions in Belize I'm finally back at Hilton Pond Center. My 32 days in the Neotropics were productive and it even looks like I've essentially gotten over that bout with viruses and pneumonia that plagued me in January. It's good to see winter rains have replenished Hilton Pond in my absence; when I arose this morning it was hosting a pair of Canada Geese and a raft of Wood Ducks--all undoubtedly intent on propagating their respective species. I'm glad to be home at last and getting ready for Spring in the Carolina Piedmont! NOTE: I'm grateful wife Susan and brother Stan Hilton kept the feeders full at the Center during the four-weeks-plus I was in Central America. It paid off and banding today totaled 49 birds! Whew! That'll wear out a bander! It seems strange today to be observing the first day of spring at Hilton Pond when I've just returned from Central America--the land of eternal summer. I must admit near-freezing temps the past few mornings here in the Carolina Piedmont have been a bit of a shock to my system. Fortunately, that keeps birds visiting feeders and entering traps for banding. Winter residents just keep on coming at the Center. Banding totals for today included 53 individuals, despite time out for a morning meeting; that's 102 birds from seven species banded in just two days! Whew, again! Like I said, winter birds continue to assemble at Hilton Pond Center. After 49 and 53 birds banded the past two days, respectively, today I handled 62 new individuals from nine species. Putting out ground traps baited with cracked corn and millet brought in some sparrows--and Eastern Tufted Titmice, too! 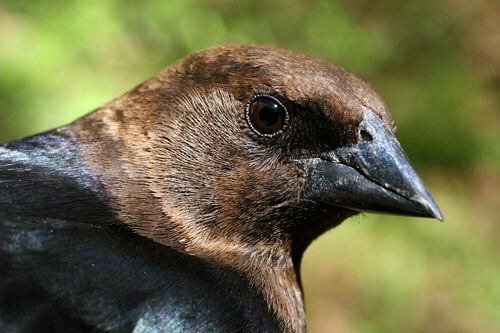 Cool weather has certainly been a factor in banding 164 individuals over a three-day period. Incidentally, if you're interested in up-to-the-minute weather conditions at the Center, they appear with a Web cam image on WeatherUnderground. Today I banded 50 more winter residents at the Center, with Purple Finches coming on strong. Altogether that's 214 birds banded in just four days. I just refilled all the seed feeders, but with precipitation in the forecast I'll probably not be running traps tomorrow. Getting wet when it's cold isn't good for the birds--or for the bander. Since rain seems to have abated this morning at Hilton Pond Center I'm running a few traps. Among others I caught a Song Sparrow that makes its species the 24th member of the Center's "400 Club." 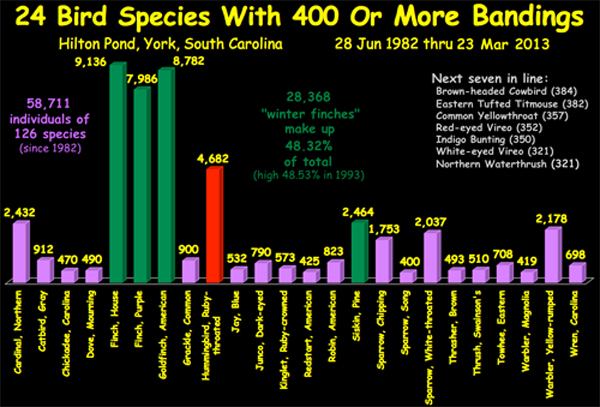 The chart above shows how other banded species rank. It's hard to believe this time last Sunday I was in Belize looking at giant Jabirus (above) in the lagoon at Crooked Tree. 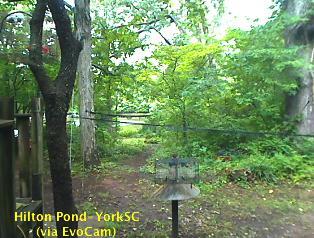 This week I'm in somewhat less tropical York SC (today's high: 44.6 degrees F.), where 0.94" of rain overnight and today have brought Hilton Pond to within 12" of full--a big change from being four feet low when I went to Central America in mid-February. If we can start the summer season with a full pond it will be the first time in at least a half-dozen years. Folks are asking when to put up hummer feeders. If you live in or south of the Carolina Piedmont, the answer is: NOW! My early date for Ruby-throated Hummingbirds at the Center in York, SC is 27 March in two different years. 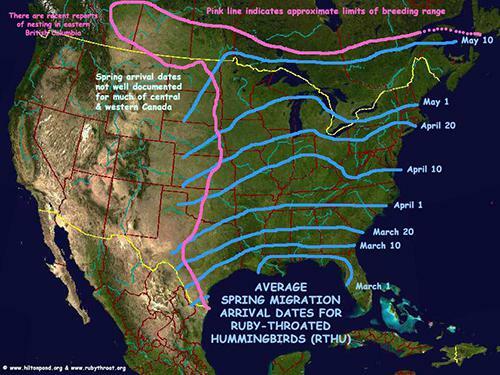 To determine when you might expect to see your own first spring ruby-throat, check out my migration map (above). A Song Sparrow I captured last week at Hilton Pond Center became the 24th species for which I've banded at least 400 individuals since 1982. That pales in comparison to the number of Purple Finches I've handled. In fact, this morning a raspberry-colored adult male (above) made PUFI the third species to join the prestigious "8,000 Club." 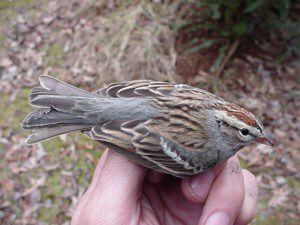 Only House Finches (9,136) and American Goldfinches (8,819) have been banded more often, and the way things are going goldfinches may join the "9,000 Club" very soon! 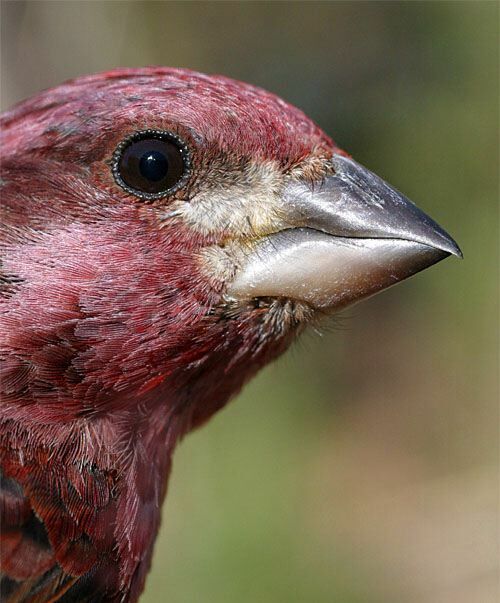 One other interesting thing about those 8,000 Purple Finches at banded since 1982: Only 404 of them--a mere 5%--were captured during fall and early winter (i.e., Nov-Dec). They typically show up here after New Years Day--a possible indicator they are facultative (non-obligatory) migrants that come south only if and when food sources on their northern breeding grounds start diminishing. I was quite surprised at Hilton Pond Center this afternoon to capture a female House Finch with a distended cloaca and a developing brood patch. The latter indicates despite the early calendar date she's already laying eggs. 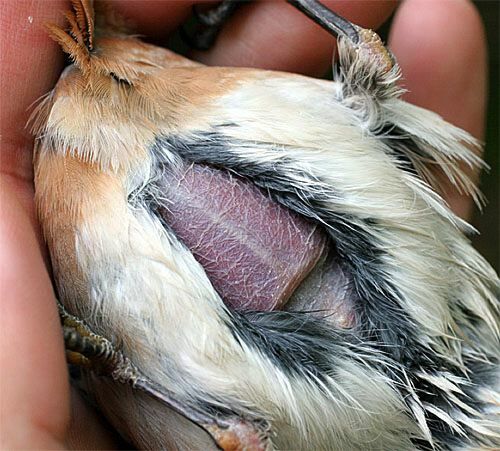 The brood patch--an area of recently denuded skin on the belly (see image above of a female Eastern Bluebird's brood patch)--means she'll be able to transfer body heat more efficiently to her eggs/chicks while incubating/brooding. Regardless of the weather, it looks like spring is underway indeed! Today I banded 44 birds at the Center and, curiously, I also re-trapped several House Finches I banded locally last summer as recent fledglings. Where they've been since then and why they showed up all of a sudden is anyone's guess. Perhaps they've been flocking together at some nearby feeding station that finally ran out of sunflower seed. At Hilton Pond Center we unequivocally believe in equal rights and opportunities for all people regardless of race, ethnic origin, gender and sexual preference, age, physical ability, financial status, education level, religious or philosophical persuasion, or ANY other factor--as implied by the logo above. The Center goes one step further, however, in offering our own modified logo (above) to represent "Humans in Harmony with Nature and the Environment." People can be fair and equal to each other all we want and need, but unless we begin treating the natural world around us with intelligence, reverence, and respect Homo sapiens has no long-term hope. Hilton Pond Center's banding results today (27 birds total) included my first Red-breasted Nuthatch (above) of 2013--but already my sixth of the current winter season. This is worth mentioning because this latest RBNU was only my 17th here in 32 years of banding. No banding today at Hilton Pond Center; the family was out of town for the Easter holiday. 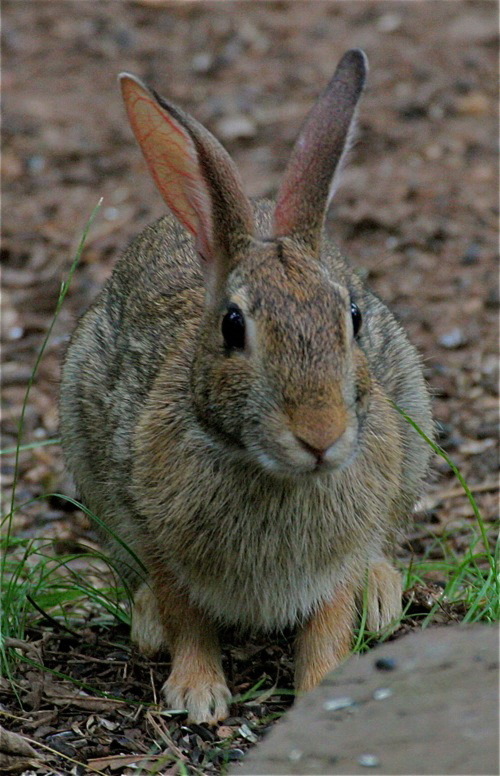 An Eastern Cottontail (above) reportedly brought and hid a basketful of colored eggs, species unknown. 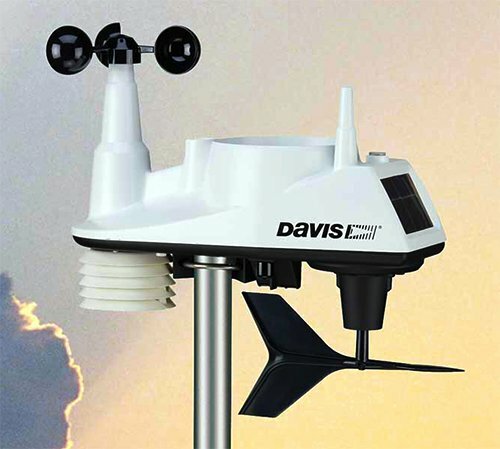 The Center also received 0.27" of wet precipitation. Thanks to the following fine folks for recent gifts in support of Hilton Pond Center for Piedmont Natural History and/or Operation RubyThroat: The Hummingbird Project. Your tax-deductible contributions allow us to continue writing, photographing, and sharing "This Week at Hilton Pond" with students, teachers, and the general public. Please see Support or scroll below if you'd like to make an end-of-year tax-deductible gift of your own. --Please see the "photo essay" above for miscellaneous Hilton Pond phenology notes for the second half of March 2013. --We also had a substantial number of returns/recaptures during the period (see list below left)--eight species and 28 individuals banded at the Center at least a year ago. 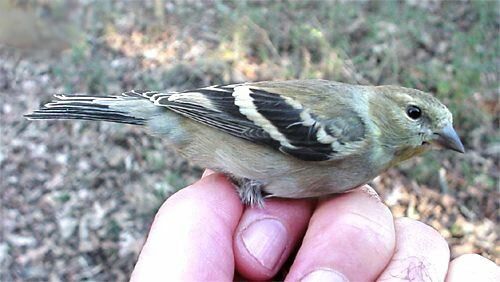 Of special note was a female American Goldfinch first encountered in 2007, making her at least an after-seventh-year bird. 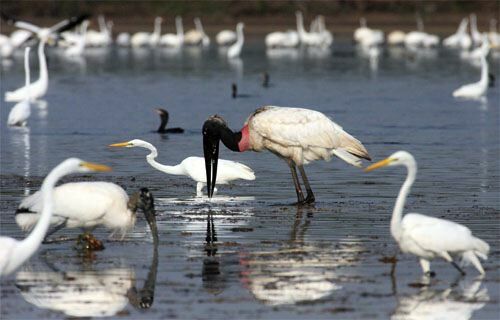 --The Center's Yearly Yard List 2013 of birds seen on or over the property stands at 34 species through 31 Mar. --Last week's photo essay was about our second 2013 expedition to Belize with the Keystone '13. It's archived and always available on the Hilton Pond Center Web site as Installment #566.